George Friderich Handel was born in Halle, Germany on February 23, 1685 and died in London, England on April 14, 1759. Handel had a great love of music but he had to study it clandestinely as his father (a barber/surgeon) wanted Handel to go into law. Eventually his father encouraged Handel to study music and he became a pupil of Zachow, the principal organist in Halle, Germany. At 17, Handel was appointed organist of the Calvinist Cathedral and then he left for Hamburg a year later where he played the violin and harpsichord in an opera house. This is where his Almira was given in 1705 followed by his Nero. A year later he went to Italy and stayed for over three years in Florence, Rome, Naples and Venice. This is where he perfected his technique in setting Italian words for the human voice. In early 1710 he left Italy and went to Hanover where he was appointed Kapellmeister to the elector, then immediately went to London when his opera Rinaldo was produced in 1711. Four more operas followed from 1712-1715 with mixed success. In 1717 Handel entered the service of the Earl of Carnarvon at Edgeware where he wrote 11 anthems and two dramatic works. In 1718 Handel was appointed musical director at the Royal Academy of Music. Handel's Radamisto was the second opera and it inaugurated a noble series over the ensuing years including Ottone, Giulio Cesare, Rodelinda, Tamerlano and Admeto. But public support was variable and the financial basis insecure, and in 1728 the venture collapsed. The previous year Handel, who had been appointed a composer to the Chapel Royal in 1723, had composed four anthems for the coronation of George II and had taken British naturalization. 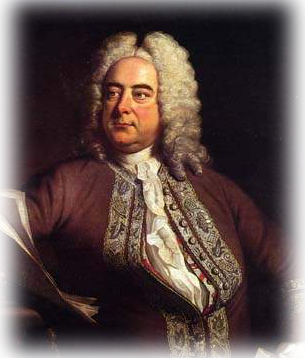 During the the 1730s Handel moved between Italian opera and the English forms, oratorio, ode and the like. After a journey to Dublin in 1741, where Messiah had its premiere, he put opera behind him and for most of the remainder of his life gave oratorio performances, mostly at the new Covent Garden theatre, typically around the Lent season. During his final years, he gave regular performances of Messiah, usually with about 16 singers and an orchestra of about 40. In 1749 he wrote a suite for wind instruments for performance in Green Park to accompany the Royal Fireworks celebrating the Peace of Aix-la-Chapelle. His last oratorio, composed as he grew blind, was Jephtha (1752); The Triumph of Time and Truth (1757) is largely composed of earlier material. Handel died in 1759 and was buried in Westminster Abbey. He was recognized in England and by many in Germany as the greatest composer of his day.